For the third consecutive week, my college team has put up huge fantasy numbers. That was thanks in large part to my starting quarterbacks, Kenny and Taysom Hill (not related) of Texas A&M and BYU, who scored 34 and 31 points respectively. 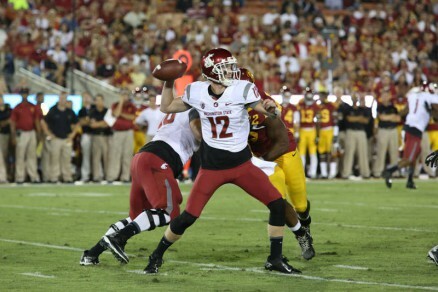 Connor Halliday led the way for all quarterbacks, scoring a miraculous 45 fanatsy points. His week by week totals are 41, 19 and now 45. I started him on his 19-point performance, and I’d like to be able to use him in the future since he has such potential. Sadly, Washington State heads into a matchup against the Ducks this week, and I’d expect them to keep Halliday, and his fantasy output, in check. Connor Halliday will have a HUGE week, as long as I don’t play him. Moving on, my running backs were hit and miss for the most part. I started Tevin Coleman, who was just about as “hit” as you can get. Coleman, the Indiana back, led all fantasy running backs with 40 points after amassing 190 yards and three touchdowns. My second back, Todd Gurley of Georgia, also played pretty well. He finished with 19 points and ran for 130 some-odd yards, but he had a touchdown called back for holding and had a few goal line touches taken away. Gurley could’ve finished with somewhere around 30 points, so I feel a little bit cheated in that regard. Finally, with my receivers, I learned quickly that this fantasy system isn’t perfect yet. Keevan Lucas, the Tulsa receiver who I wanted to start, wasn’t even listed as an available player to use. So when I set my roster, I had to make a quick change just based on my gut and I took a long-shot in Jamison Crowder of Duke. Crowder was shut down and finished with only one point, and basically ruined what could have otherwise been a great fantasy week for me. My other receiver, Amari Cooper, performed just as expected, though. Cooper has 33 receptions on the season, an average of 11 per game, and that’s even more impressive when you consider that Blake Sims, Bama’s QB, only has 48 completions on the season. If you do the math, Cooper has more than 66% of Alabama’s receptions this year. Talk about a favorite target? 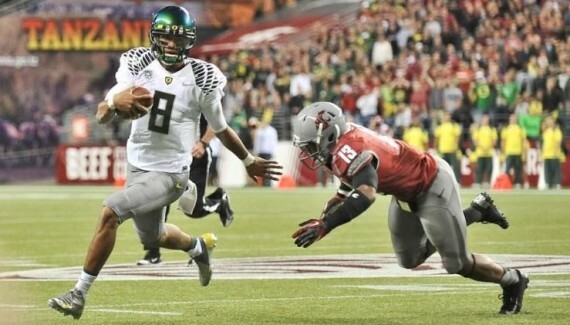 Mariota has done a little bit of everything for the Ducks so far. As a promise to myself, I agreed that I’d play a member of the Ducks every week and, I mean, who else would I choose here? 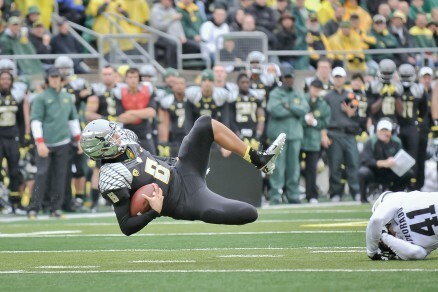 Mariota has done it all this year, both through the air and on the ground. He’s got eight passing and three rushing touchdowns, and he heads into a Week 4 matchup against a Washington State defense that actually seems to make an effort to let their opponent score. Halliday could keep WSU in the game for a little bit, which means Mariota could see some extra playing time, but in the end I predict the Ducks blow the Cougs out and another huge week for the Heisman hopeful. Have you heard of him? No? That’s okay, I hadn’t either. Hare is the replacement to Heisman candidate Jordan Lynch for an NIU football program that is always better than people give them credit for. Like Lynch, Hare seems to have the ability to score both on the ground and through the air, which is a valuable trait in the world of fantasy. And, more importantly, in a week where other favorites of mine, Dak Prescott of Mississippi State and BYU’s Hill play tough teams, I figured I’d go with someone new. Hare was originally fighting for the starting position, but seems to have claimed it for his own following a gutsy win against UNLV and totaling over 350 yards of offense and four TDs. My plan could back fire, but NIU plays a weak Arkansas defense this week and choosing Hare here (ha ha) could work out. Jay Ajayi will be looking to bounce back after a disappointing Week 3. Ajayi is the opposite of my Halliday. Connor scored 41, 19, 45 and I started him the week where he scored 19. Ajayi scored 23, 45, 4, and I started him the week where he scored the 45. Can’t win ’em all, right? BSU plays Louisiana Lafayette this week, a team that has surrendered 104 points over the past two games. If I know Ajayi and the kind of competitor I believe he is, he’s about to go off. Lousiana Tech running back Kenneth Dixon only needed 12 carries to reach 184 yards and two TDs against this ULL defense, and he’s half the player Ajayi is. I like Ajayi because BSU uses him not only in the run game, but in their aerial attack as well. 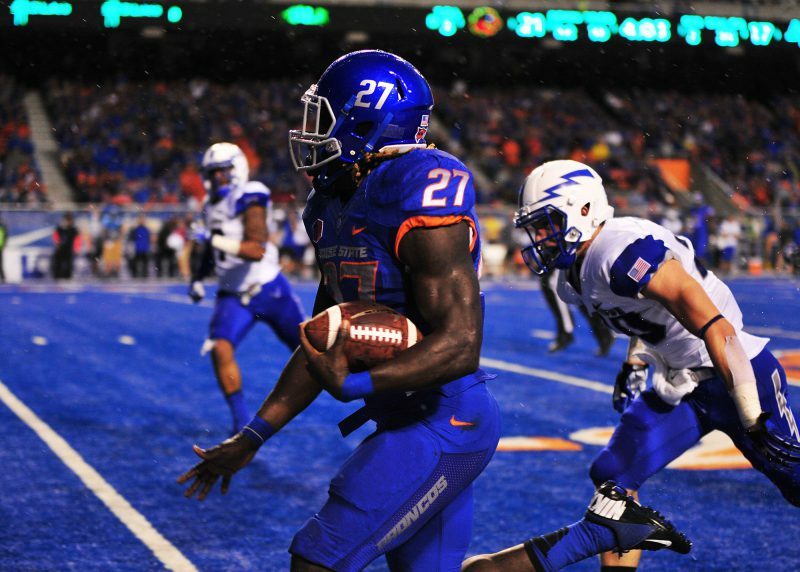 Even though he struggled, Ajayi still got 18 touches in his last game against Connecticut and he also caught an additional two passes. Now imagine giving him that volume of reps against this ULL defense? That’s a fantasy player’s paradise. I almost took this guy solely based on his name, but I promise there was actual statistic-based reasons to take him, too. Hawaii loves to run the ball, and after their senior starting running back, Joey Iosefa, went down with an ankle injury, Lakalaka willingly took over. The sophomore ran the ball 32 times against Northern Iowa, only managing 124 yards, but he did score a touchdown and showed promise when he broke off a 30-yard run. Hawaii plays Colorado this week, a team that just gave up 150 yards on the ground to D.J. Foster of Arizona State. Although Foster is a much better player than Lakalaka, Colorado’s run D is incredibly weak. For a team that loves to run as much as they do, I expect Hawaii to run Lakalaka all day long. See above. I apologize if it’s a boring pick, but you can’t argue with a guy that commands 70% of his team’s targets and is the best receiver in the nation. Only easy pick of the week right here. My WR2 has yet to do anything good so far, with both Devin Funchess of Michigan and Crowder combining for 11 points in the past two weeks. I have high hopes this week though, as Spruce has been one of the most reliable receivers in all of college football through the first three weeks. Spruce has six touchdowns on the season, with two in every game so far. Last week was his worst week for yardage, but he still managed to grab seven passes for 97 yards. Spruce was Paul Richardson’s (now with the Seattle Seahawks) complementary receiver last year and has settled into the role of primary receiver — quite nicely it seems. Colorado plays Hawaii, and my RB2 Lakalaka, this week, and that Warriors team is nothing special. I expect Spruce to have an average week, but lucky for me average means somewhere around 25 points! MSU is rested coming off a bye week, and they’re angry they gave up 28 unanswered points to our beloved Ducks. They come in to a cream puffish matchup against Eastern Michigan this week, but I think there are few folks in East Lansing that are going to treat this game as a gimme. If this defense doesn’t put up a zero on Saturday, they’re going to be disappointed. Sticking with the strategy that if a team scores a lot of points, they kick a lot of field goals and extra points. Baylor scores a lot, Oklahoma scores a lot, and Marshall scores a lot, but it just so happens I like Marshall’s group of kickers the best. Personal preference here, but you really can’t go wrong with any of those teams’ place kickers. Another week, another lineup. This is a make-or-break week for me, as I have climbed up to fourth in the entire group of Oregon Duck fans. I’m taking some big risks with Lakalaka and Hare, but hopefully they’ll pay off. As always, tell me what you think in the comment section below!